From Victoria BC’s Driftwood Brewing comes the “Raised By Wolves IPA” wild IPA using the yeast Saccharomyces Trois. The beer pours a golden colour with an off white head. The aroma consists of tropical fruits, mango, sweetness and floral hops. The flavour is of earth, resin, bitterness, tropical fruits, mango, pineapple and malts. The alcohol content comes in at 7%. This beer has that same thick body as Fat Tug IPA that is almost chewy. This IPA is awesome and kicks Fat Tug IPA’s but in every way! Commercial Description: Born of Equinox hops and raised under the influence of Saccharomyces Trois , this beast has developed a taste for mango, citrus & melon, with a nose to match, hear the call! THIS ONE WAS ABANDONED TO THE WILD. 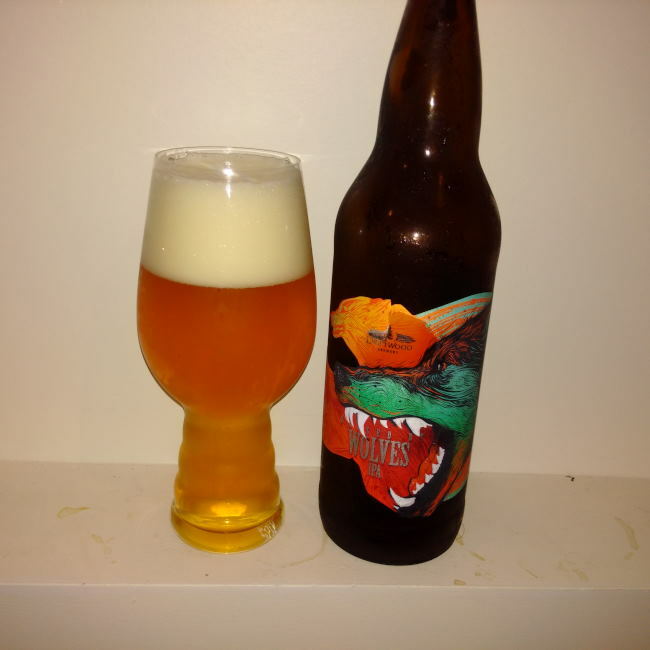 This entry was posted in India Pale Ale and tagged bc, bitter, bitterness, canada, craft beer, driftwood brewing, earth, earthy, hopped, hops, hops bitter, hops bitterness., hopy, india pale ale, IPA, malt, malts, malty, mango, pineapple, raised by wolves india pale ale, raised by wolves ipa, resin, saccharomyces trois, tropical, tropical fruit, tropical fruits, victoria.